Fire is not a thing, it is an event. It can be defined as a chemical reaction that releases light and heat. In this process, substances combine chemically with oxygen from the air and typically give out bright light, heat, and smoke. It requires three components to exist which are oxygen, heat and fuel. A fire cannot ignite if any of these components are missing. The term ‘fire’ has a West Germanic origin. Earth is the only known planet where a fire can burn because there is no other place with enough oxygen. Oxygen supply can change the color of the flame. A flame with high-oxygen is blue in color. No one knows who invented the fire hydrant because its patent was destroyed in a fire in 1836.
Credit is generally given to Frederick Graff Sr., a chief engineer at Philadelphia waterworks. 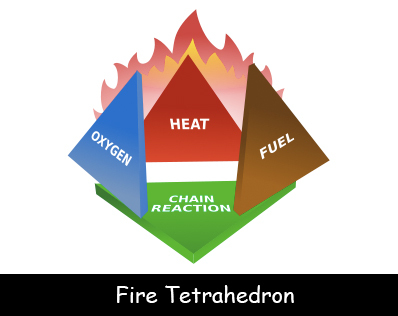 A fire will be extinguished when you remove any of the three required components. The forest fires move faster uphill than downhill. Fire is very fast as it takes less than 30 seconds to become very difficult to control. Every year, more than 2,500 people die and 12,000 get injured in home fires in the United States. Most house fires start from the kitchen. The leading cause of home fires is overheated grease and unattended cooking. Fire is deadly as it uses up oxygen that you need to breathe and produces smoke and poisonous gases. The largest consumer of fireworks in the United States is Walt Disney World. Firehouses have spiral staircases because the horses that used to pull the fire wagons learned to walk up straight ones. Declan, Tobin. " Facts for Kids about Fire ." Easy Science for Kids, Apr 2019. Web. 21 Apr 2019. < https://easyscienceforkids.com/facts-about-fire/ >.